We flew from red and yellow Netherland tulip fields to Croatian mountains, with the snow-covered Alps near Munich between. As our plane followed the mountain ridge along the coast of Croatia, we passed numerous small and rocky islands. 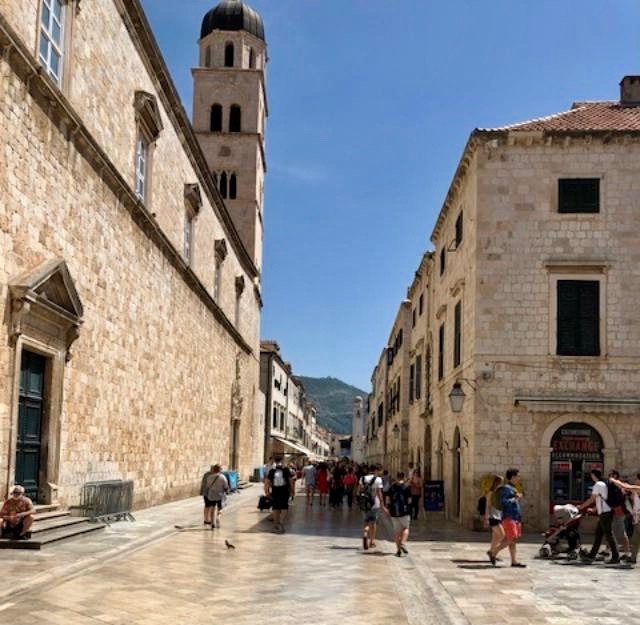 The Dubrovnik International airport is very modern and spotlessly clean, and the passport line proved to be quick and painless. Picking up our rental car was equally a breeze, with English speakers everywhere we needed them. 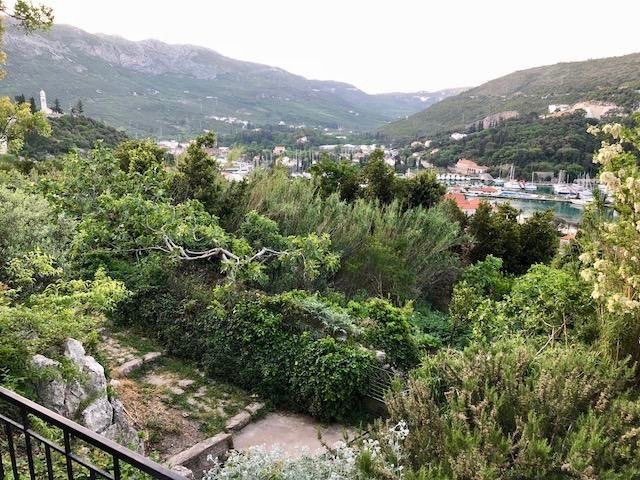 The homes and buildings along the Croatian coast are nestled on the foothills of the mountains that separate Croatia from Bosnia in the Dubrovnik area. We are staying in an old rock home we found listed on Airbnb. Recent remodeling turned it into a beautiful 4-bedroom home with plenty of kitchen, dining and family room space. The BnB is nicely situated near bus lines, shopping, grocery store and gas station. 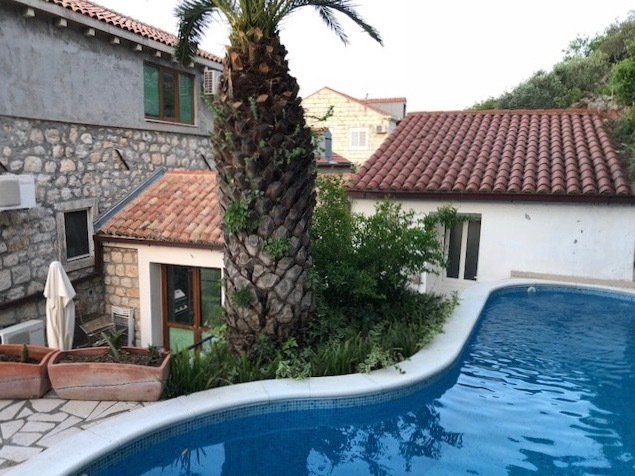 We also have the use of a nice swimming pool. Note the unique shape! 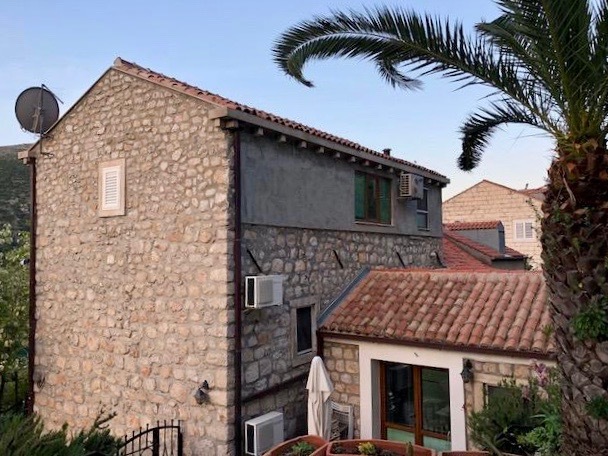 Located at the end of a narrow road on the hillside in Prijevor, the home overlooks the bay below and an old church sitting on a hill. But what about the guillotine in the back yard? 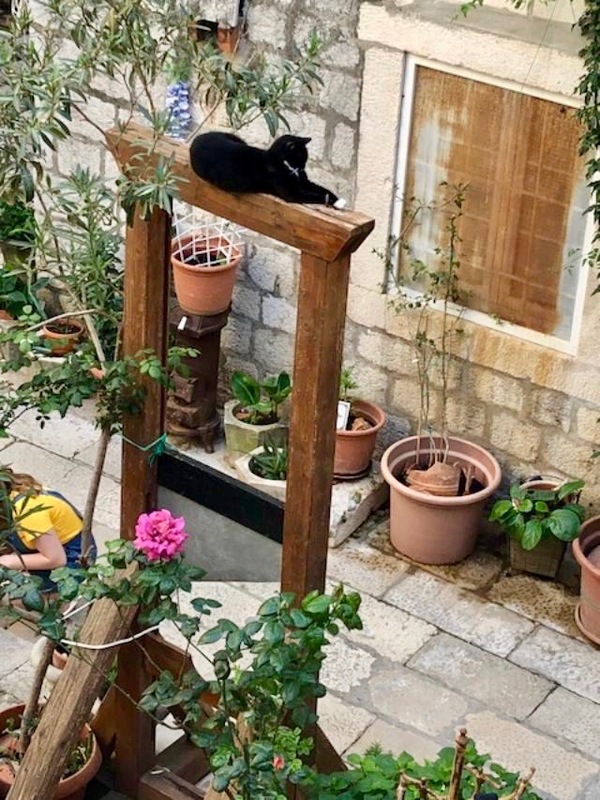 The cat lounging on the top beam looks tranquil enough, but that guillotine’s blade is lifted . . . apparently poised for use! Flowers in a pot nearby help soften the effect, but still . . .
We drove through the hotel and tourist areas on narrow but adequate roads and could glimpse the Holland America cruise ship, Oosterdam, in port. From there we walked to the “Old City,” and were pleased to find plenty of pay public parking. The Old City, however, turned out to be a long walk from where we parked, involving a lot of stairs. 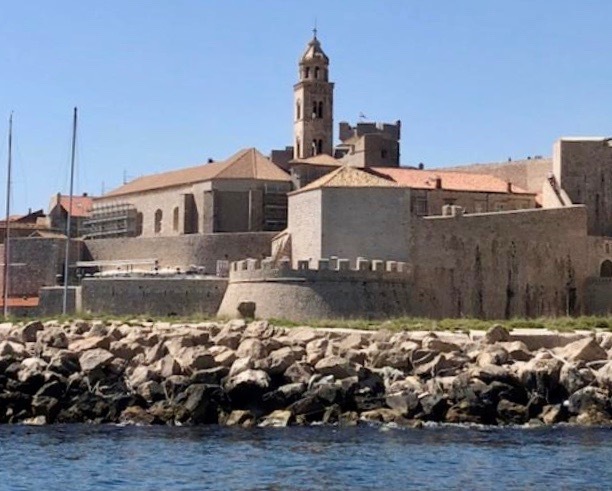 Listed as a UNESCO World Heritage site, the devastation of the 1990s political conflict has largely been erased from public view. 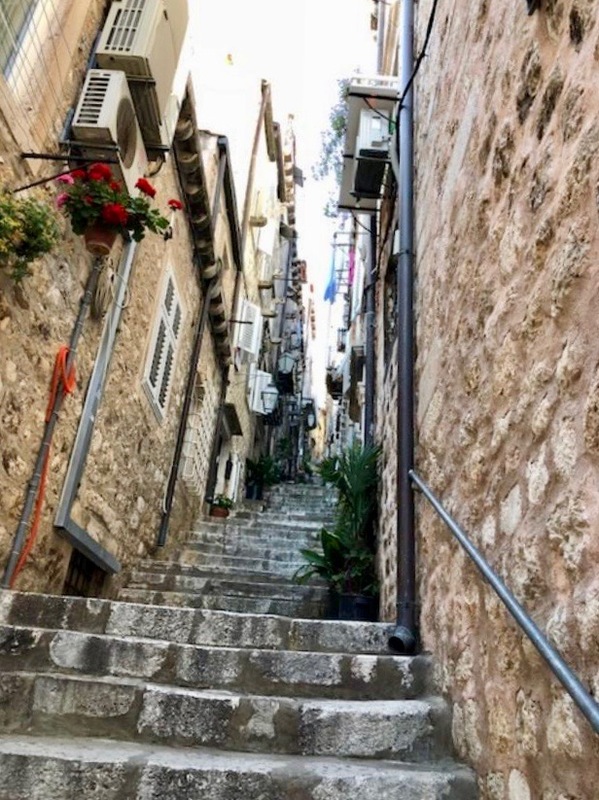 One thing to note about the old city beyond the multitude of stairs is the uneven walking surfaces. Nevertheless, there were plenty of elderly tourists navigating the narrow streets and the rampart of the old Fort. 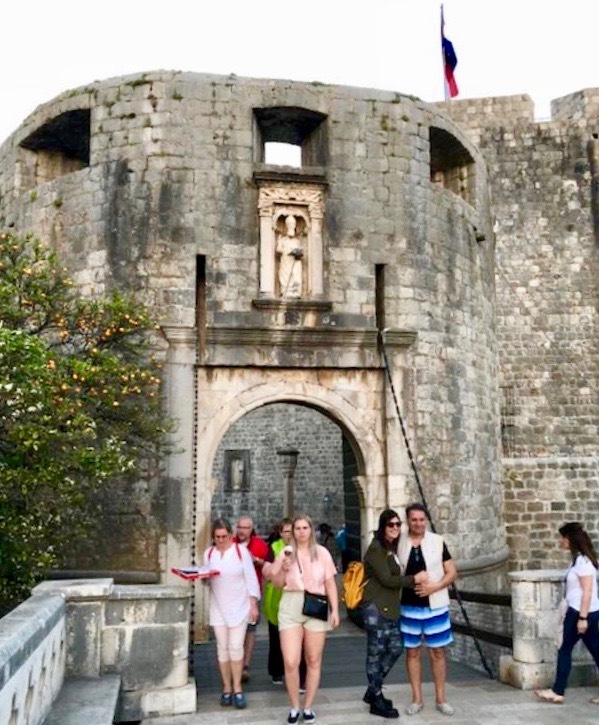 The old city is completely surrounded by a tall fortress wall, complete with draw bridges we had to cross in order to enter the gates. I’m afraid I’ve seen too many adventure movie chase scenes to feel completely comfortable walking across a draw bridge. 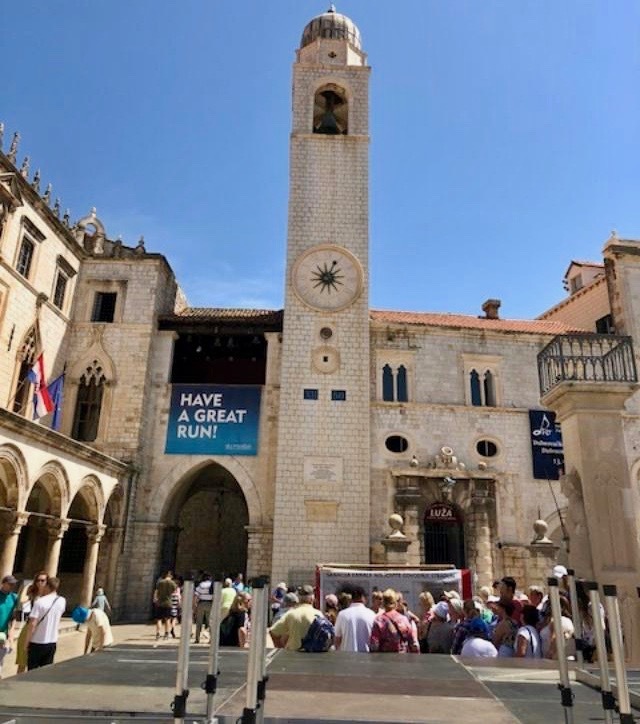 My daughter-in-law told us before we arrived that the city reminded her of Venice. Even though it doesn’t have canals, I can certainly see why. 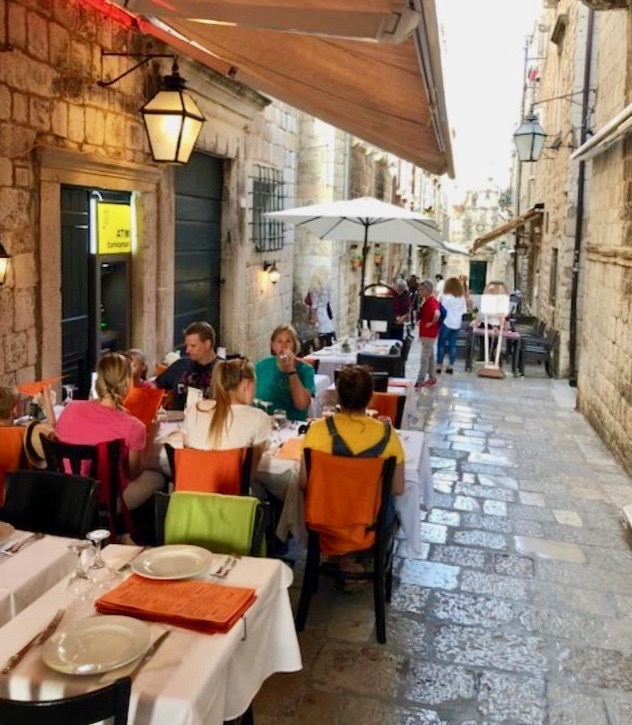 Tall limestone buildings lined the narrow streets and below, steep stair-stepped alley-ways wound past ATMs, pharmacies, and interesting boutiques for shopping. 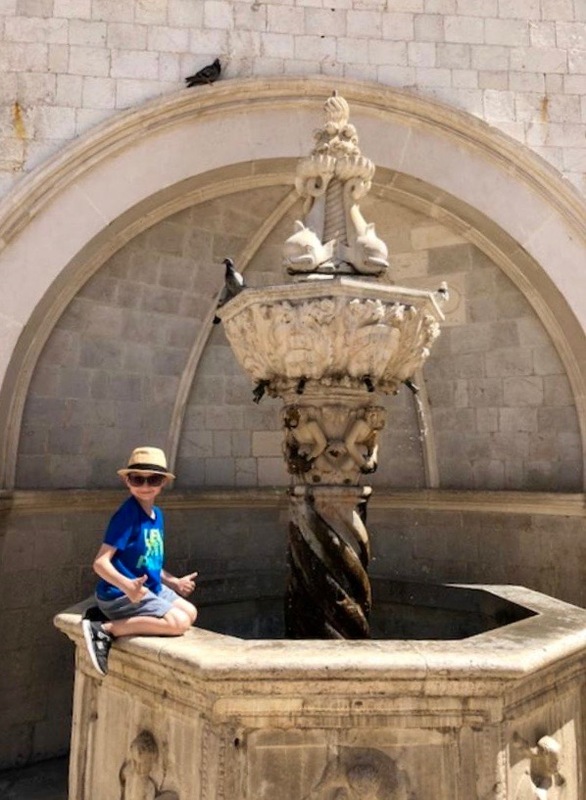 The city is very clean and absolutely charming with its fountains, markets, and restaurants. 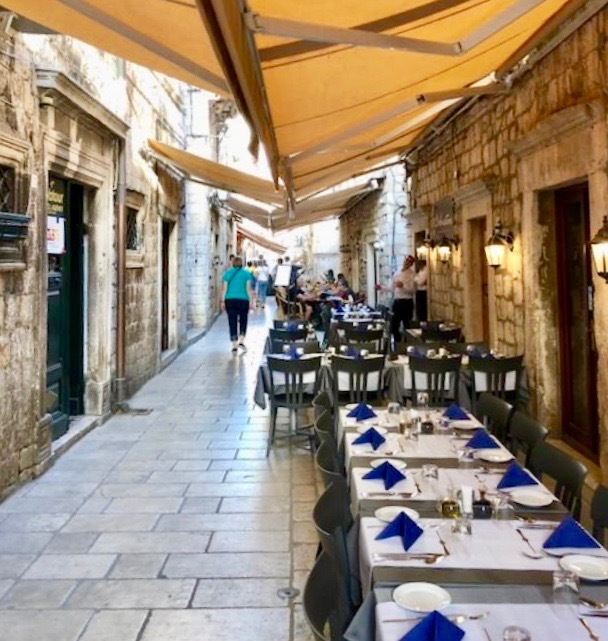 Having a Mediterranean dinner in one of the many alley way restaurants was a highlight. 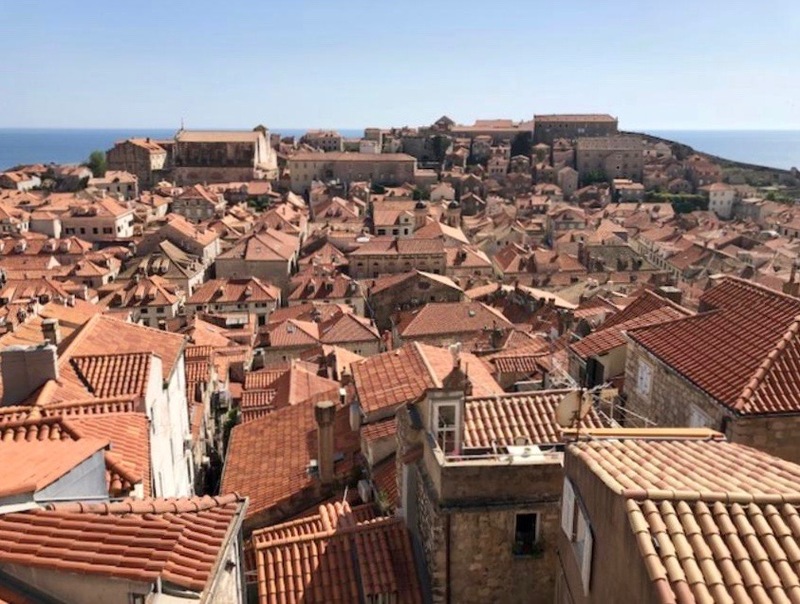 From above, red bar-tile roofs and the fortress wall contrast with the sea beyond. 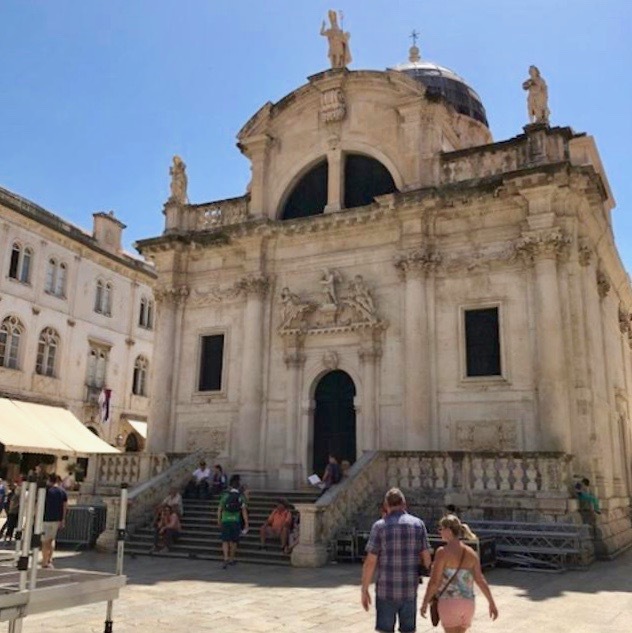 We had read how the city was strongly influenced by the Venetians. 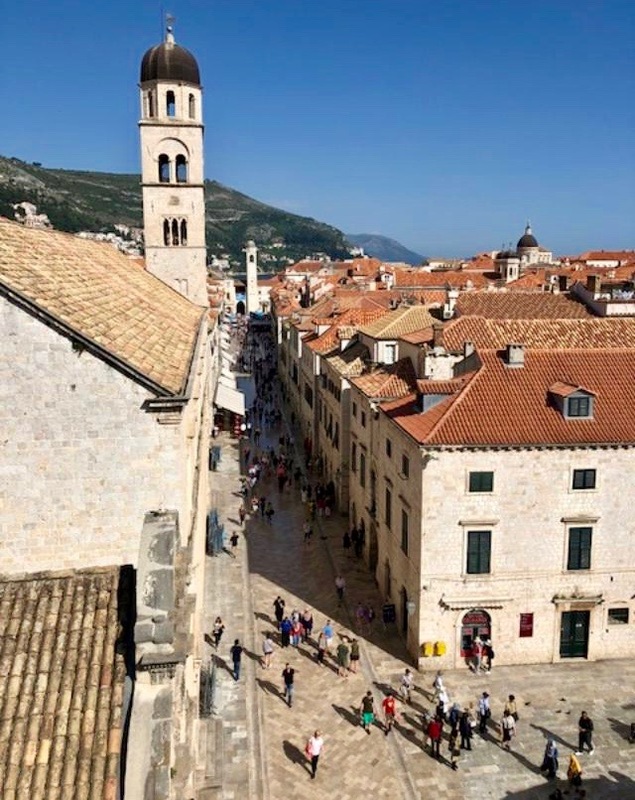 Here are some sites with fascinating information on Dubrovnik’s extensive and colorful history. 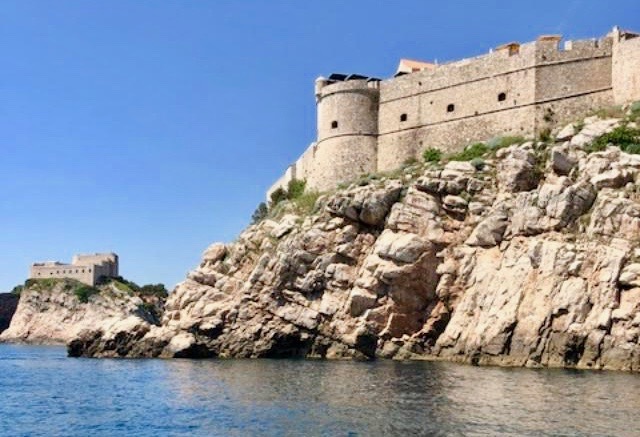 We took an afternoon boat ride in the Adriatic Sea to see the fortress from the sea and the coast line. The view was dramatic, but when you think of Croatian beaches, don’t imagine the Caribbean. Nice beaches are pretty scarce here. Tomorrow we plan some sea kayaking to one of the islands. 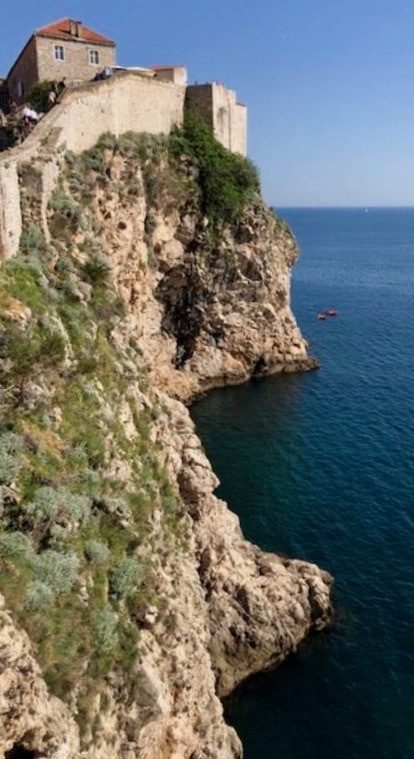 We will also drive to the top of the mountain peak overlooking Dubrovnik and the sea. A gondola goes to the top but is expensive, so we’ll see how the pocket-book feels after breakfast tomorrow.